Every day, dairy farmers go to great lengths to care for their cows – the humans can’t rest until the cows are comfortable. So we asked some of our real farm wives to share the times they went the extra mile. We had a newborn calf whose mother had stepped on and broken her leg. I wrapped her up in a blanket, put her in the front of the truck in the floorboard and took her to a veterinarian, who casted her leg. I then kept her in our house, and fed her a bottle two to three times a day until she got her strength back. The room where I was keeping her had a tile floor, so she soon needed to be returned outside – not only was I ready to quit cleaning up after her, but she also needed to get traction on the dirt to start moving around and get her mobility back. I’ve kind of got a soft spot for an older cow in our herd. The other cows are always pushing her away from the feed, so when I go out to the pasture, I’ll bring extra feed and call her over to the other side of the truck, out of sight of the rest of the herd, and give her a little extra handout. I have to be very quiet so as not to let the other cows know what's going on, or they’ll catch on to my little trick. During the cold months on our dairy, we take extra precautions to care for our newborn calves. We try to get them indoors and dried off as quickly as possible. We have a heater in the barn and heat lamps above each of them. They each have their warm bottles of milk. We want them to be nice and toasty! Earlier this year, we had a major snowstorm. You might have heard of it: winter storm Goliath. Well, Goliath created some extremely cold temperatures. Our normal cold weather routines were not enough. We decided to use some blankets to wrap them up with and add to their beds. Well, the dairy only had so many blankets and towels on hand. And during the storm there was no “running to town” to get more supplies, since the roads were closed. Luckily, our house is only about 200 steps to the dairy barn. I collected every blanket I could from my house, including most of the blankets I store in my coffee table, old college dorm blankets, throw blankets and even some extra blankets from my daughter’s nursery. Well the storm passed and now we are back to business as usual, but I never got my blankets back. It’s OK though, because every time we have a colder night, I can go into the barn and still see my family’s blankets laid down for the calves to keep them warm. Seeing them reminds me how important our cows and calves are to us. Our heifer was born about five weeks premature. About 25 lbs. No hair – in February. I fed her six times a day: 4 a.m. was her first bottle and 11 p.m. her last. She lived in our house for a couple days, then in a box with two heat lamps. After she got weaned, she got a snakebite, and we had to drain her leg for weeks, with icepacks every night. Now, she’s doing super and is just as big or bigger than the rest of herd. She got pregnant and the girl delivered twins! This story is not what I did for the animal, but what she did for me. She found my breast cancer. I still truly believe she was an angel send from God to help me. I would not have found the lump this early or easily. Gemma found my cancer by bumping me in that breast. I remember it very well. It hurt a lot. For days. So I started feeling around. Big bruise on the inside. It got a little smaller but then it stopped getting smaller and just stayed the same. And it was hurting. Cancer doesn’t hurt, so they say. My doctor was really thinking it was an infection from the bruise. I had a different feeling from day one. Finally, three months and three visits later, I asked him about a sonogram. He agreed. They found fluid in an abscess – not a sign of cancer. Still, I was pushing for a biopsy. When they did that, I knew it. I’ve seen enough cancer tissue with the cows. It was the same. If it was not for Gemma, I would have found it even later. I’m SO THANKFUL she bumped me that hard in my breast. God knows how to send you a message. I know I’m not always listening to people; he knew I had to have a cow speak to me. Cows are my life, and now one saved my life. We lost her when I was going through chemo. It broke my heart when she died. It was in matter of hours. They found her and she did not respond to anything. First, I was so upset and cried. But know I’m at peace with it. It just confirmed to me that she was that special angel and had to go help other people. Angels don’t always come in the form we think they do. God sends them in the form you need. It was a Brown Swiss calf for me. Since then she has had two sisters: Gloria and Gertrude. Both names mean “glory to God.” They will go to Stillwater this year and will be shown. I will be crying again when they go in the show ring, but happy tears and so thankful. 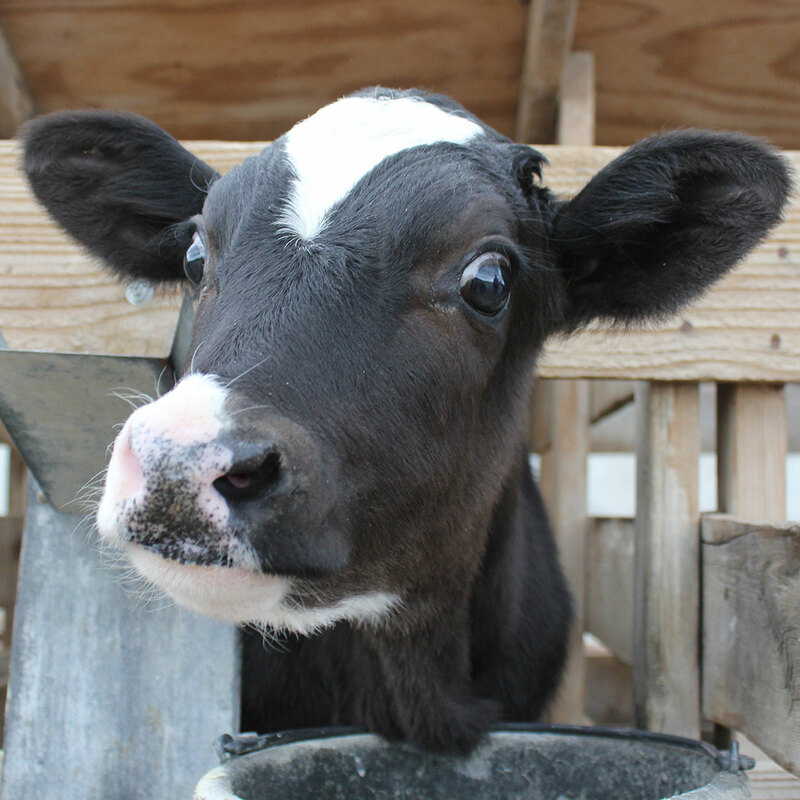 Meet more of our local dairy farm families here.